As mentioned in the past, the Japanese sword is designed with the purpose of “chopping”. 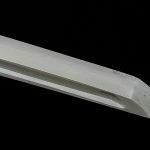 This means that making the blade shaper and giving it more cutting ability becomes the most important thing. 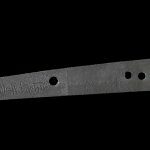 To make it cut better, you need to make the blade thin, but if it is too think it can get chipped or broken easily. The swordsmiths back in the day came up with the idea to gradually make it thick as it gets away from the edge. But making it too thick makes it heavy and hard to use. 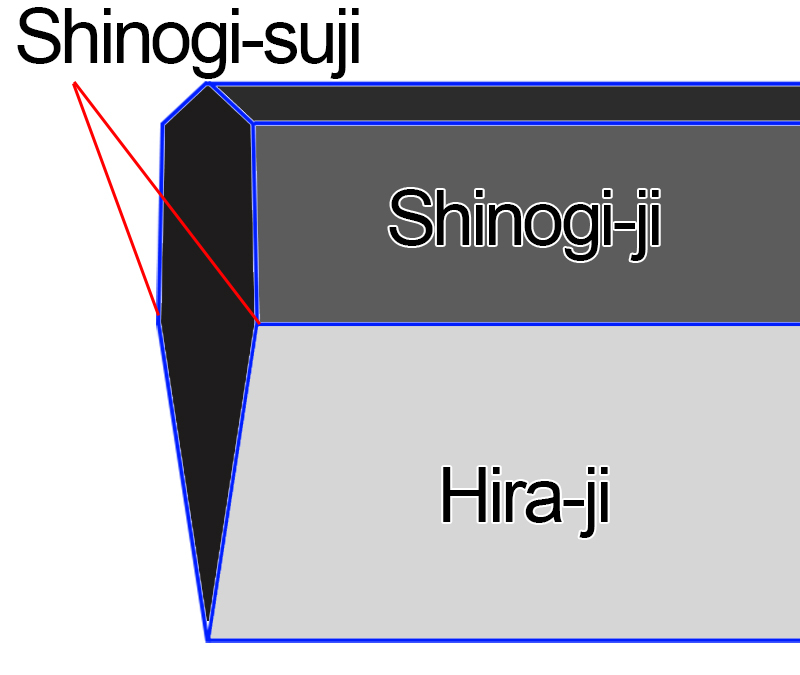 As they pondered how much thickness they should add, the shape of the “shinogi” (ridge) was born. 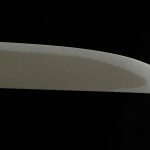 The shinogi is a typical feather of the Japanese sword, and a part that represents the beauty of the Japanese sword. 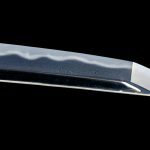 The shinogi usually refers to the ridge line at the thickest point of the blade, and the side away from the edge is called “shinogi-ji” and the side toward the edge is called “hira-ji”. The width of the shinogi varies between generation and school and strongly reveals their characteristics. If the area from the ridge line away from the blade edge is wide, they say the “shinogi-ji is wide”. This style was quite common during the early Heian period, but lost popularity as time went by. On the other hand, when the same area is small they say the “shinogi-ji is narrow”. 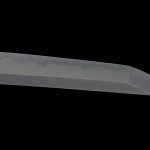 As the blade edge area is wide, it makes the sword light and sharp. The “shinogi-suji” (shinogi line) is the border between the shinogichi and the hirachi. If this part is thick, they say the “shinogi-suji is high”, making it a heavy and strong sword. 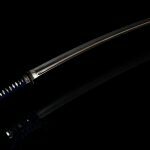 On the other hand, if they say the “shinogi-suji is low”, the sword would be light and sharp, giving it a smart appearance. The generation of Kanbun new swords show these latter characteristics. The area around the edge is called “hira-ji”, and when this part is heavy it is called “hiraniku tsuku” (full of flat meat) and it is a strong sword where the blade does not wear off easily. This is common in the tachi seen in the Kamakura era, when fighters needed to cut through thick armory. On the other hand, if this part is thin it is said “hira niku kareru” (lacking flat meat). This style is seen around the time when firearms began to spread in Japan, and as Japan experienced peaceful times in the Edo period, this style become more and more common. 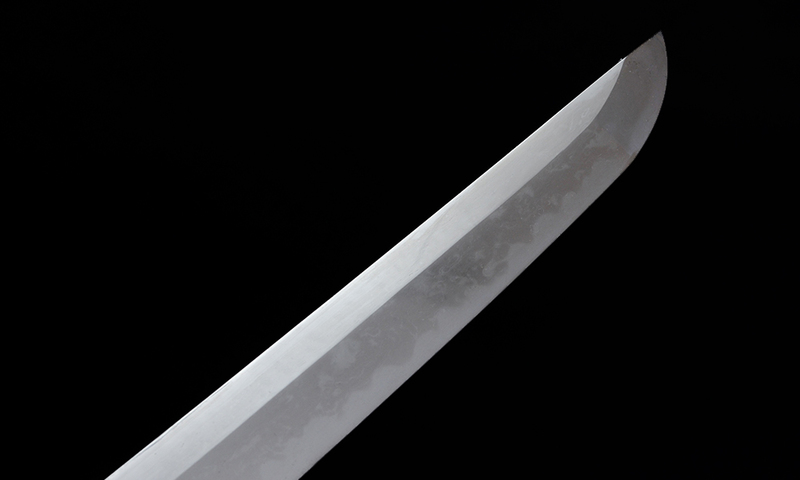 In addition to the shinogi, the blade also has an area called “mune”, which is the back part away from the edge. The most common one is a triangular one called “iori (house) mune” but there are square ones, round ones, and even one that is called “three mune”. The iroir mune is called that because it looks like the roof part of the house. It is also called “yuki no mune”. This mune is also an area that strongly reveals the characteristics of the times and the school it belongs to. For example the swordsmiths from Yamato (Nara) make the mune high, whereas the Bizen (Okayama) smiths make them low.